We drop some of these ratios into your bonus packs from time to time. They are great indicators used as an early-warning signal of upcoming cashflow problems. Monitor them over time, watch the direction of the trends and get advice if they are heading the wrong way – before it’s too late! Your Debt Ratio compares your total debt to your total assets. It includes all your borrowings, both short and long term. This is a number that you, in most cases, want to see going down over time. If it’s over 100% (or 1 in some formats), it means you owe more than you have in assets. This is common for growing businesses where you have borrowed to invest in the future but haven’t yet recovered the initial borrowings. If your Debt Ratio is over 100% there’s no need to panic but you want to see it decrease over time. If it’s not doing that, or it’s increasing and you’re not investing in new growth, something isn’t right. The Working Capital Ratio compares your short-term assets to your short-term debt. Short-term generally means the loans that are due within 12 months (your payables, credit cards, tax debts – that sort of thing) and assets that can be converted to cash in that time (cash itself – or a bank account, your receivables, stock you have for sale and so on). Be aware that us accountants are not famous for making things easy for you. 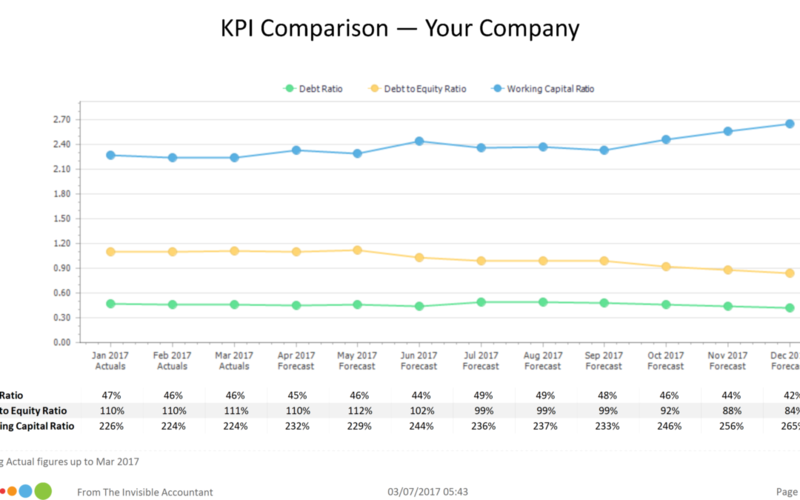 This ratio works the opposite way round to the Debt Ratio – you want to see this one rising and anything under 100% can indicate short-term cashflow issues. If that’s what you’re seeing, get some advice well before it becomes a problem. Remember that a stitch in time saves nine! If you want a technical term to impress your friends at your next barbecue, talk about leverage. What we’re comparing here is your total borrowings (that’s the debt part) with your investment in the business (that’s the equity part). The Debt to Equity Ratio tells you how much the business is financed by borrowing compared to the owner’s funds. A business that is funded mostly by borrowing (so this ratio is high) is said to be highly leveraged. There’s no right or wrong here (well, as long as the cost of the borrowing is less than the income it generates), but generally, more debt and less equity implies a greater risk. Banks and investors usually prefer lower leverage as it protects them if the business hits a downturn – the owners have more of the risk. But if your leverage is too low, you could be missing out on opportunities. If you have the capacity to borrow, you may be able to put those funds to good use to generate growth – but then again, not everyone wants to grow and we all have a different appetite for risk. So, think about the Debt to Equity ratio in terms of risk. If you’re a growing business and willing to take a punt on your talent, you’ll be comfortable with a higher number. If you’re a mature, established business that’s been around for years, you might prefer a lower number to protect your investment as you head towards retirement.